Any man who gives a damn about his appearance is constantly dealing with the tension between style and comfort. Ideally, your clothes should fit well, look great and feel comfortable. But let’s be honest: sweats are more comfy than trousers. Untucked shirts are almost always more comfortable than tucked shirts. And, strictly from a comfort standpoint, most guys would choose sneakers or flip flops over dress shoes any day of the week. But you can’t where sweat pants and grandpa shoes to the office – or anywhere, for that matter – and expect to be taken seriously. So what’s the stylish man to do? People were meant to walk and run in bare feet, not bulky shoes with thick padded soles. Barefoot running requires you to land on the balls of your feet, rather than using the standard heal-toe technique that most people are used to. Barefoot enthusiasts claim that stuffing our caveman feet into heavily padded shoes every day causes all sorts of problems, like chronic joint pain and plantar fasciitis. Supposedly, going barefoot can prevent these problems. Of course, most people don’t want to go shoeless – it’s dangerous and socially unacceptable – which is why barefoot shoes were invented. Up until recently, however, the focus has been on casual and athletic shoes, rather than formal, office-appropriate footwear. And most of the orthopedic (built for comfort) dress shoes I’ve seen are pretty ugly. Fair enough, but if you’re like me, your feet are probably sore after 10 hours in dress shoes. What man doesn’t love to take off those stiff Oxfords or heavy boots at the end of a long day? Heck, I’ll take my shoes off under the desk for some mid-day relief! If you can identify with this, the barefoot dress shoe is worth checking out. It was created by a fellow modest man – Evan “Mountain” Chang (epic name, right?). I got a chance to get to know him when he stopped in DC on his way across the country from California, and he is one interesting dude. Mountain is a champion power lifter and outdoor enthusiast. By day, he practices accounting, but he’s been moonlighting as a cobbler, and his shoes are ready to be worn. 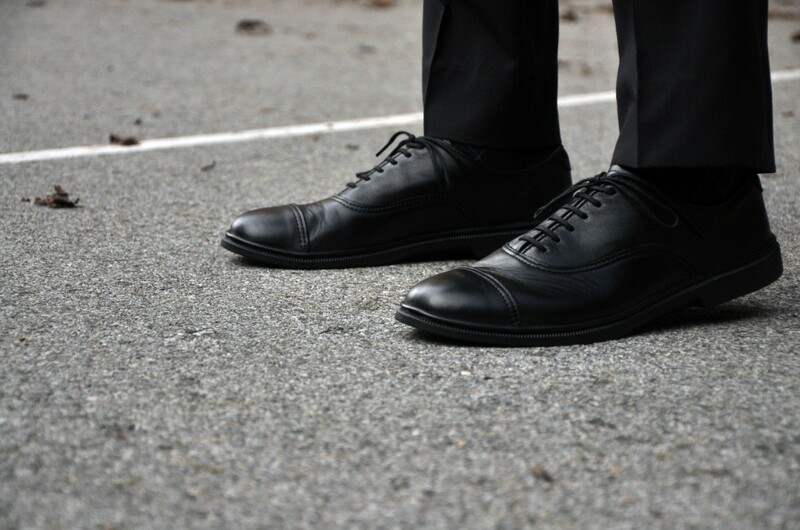 He went with a classic black Oxford (available with a plain or cap toe), a design that never goes out of style. The cap toe version is similar to the Allen Edmonds Park Avenue, one of my favorite dress shoes. After trying out these shoes myself, I can confirm that they are, in fact, more comfortable than other dress shoes that I own and wear regularly – even high end ones. They are slightly wider than my Allen Edmonds, which is great for anyone with a wide foot. They’re made with premium quality leather that’s a little softer than what you’re probably used to. This is nice because it flexes over the top of your foot (perfect for people with a high instep). These shoes are available down to size 7. Like any dress shoes worth investing in, they are resoleable, so you can get them restored after a few years of heavy use. They also come with an unheard of 365 day free return policy, which is great because they are not a cheap pair of shoes. I also love the fact that they’re made in Wisconsin. In my opinion, any company that keeps their manufacturing stateside deserves a little extra respect.